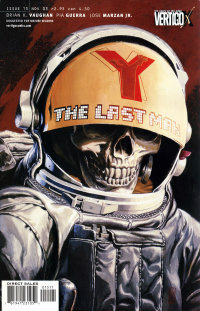 Y: THE LAST MAN Adaptation Lives! Adds New Writers and Director! It's been years since we first heard talk about a movie adaptation of Brian K Vaughan & Pia Guerra's comic book series "Y: The Last Man." D.J. Caruso, a hot director at the time who has since lost a bit of his gleam, was attached to direct but since that news in 2008, the project has been sitting stagnant with writers attached, rumours that it might be a TV show instead of a movie... but for the last year or so we haven't seen anything new on the project. Until today. News out of Hollywood is that the long gestating project has not only a new director but also a new script. The new adaptation comes from the writing/producing duo of Matthew Federman and Stephen Scaia, best known for their work on "Jericho" and "Warehouse 13." As for directing duties, those have been passed on to commercial director Dan Trachtenberg who made quite a splash a few years ago with Portal: No Escape, a short movie which he directed based on the "Portal" video game (you can see that short film here). For those not familiar with "Y: The Last Man," Vaughan and Guerra's comic takes place in a world where everything with a Y chromosome has died off, with the exception of Yorick Brown and his Capuchin monkey Ampersand. Society is plunged into chaos as infrastructures collapse and the surviving women everywhere try to cope with the loss of the men, their survivors' guilt, and the knowledge that humanity is doomed to extinction. Vaughan meticulously crafts the new society that emerges out of this chaos, from the conversion of the phallic Washington Monument into a monument to the dead men, to the genesis of the fanatical ultra-feminist Daughters of the Amazon, who believe that Mother Earth cleansed itself of the "aberration" of the Y chromosome, to male impersonators becoming valued romantically and professionally. Over the course of their journey, Yorick and his friends discover how society has coped in the aftermath of the plague. However, many of the women they encounter have ulterior motives in regard to Yorick. Though the subject matter of the series is entirely serious, Y: The Last Man is also noted for its humor. Yorick in particular is a source of one-liners, although the other characters have their moments as well. No idea if this news means the project is finally moving ahead but the announcement certainly suggests that something is happening which is better than crickets. And if you need a little something from the "Y: The Last Man" universe to keep you going until more news are announced, it's worth checking out this great fan made short film.